Last week Lapeer County Central Dispatch received a grant of $1,000 from energy company Enbridge. Enbridge owns and operates crude oil and natural gas pipelines throughout the United States and Canada including Lapeer County. Every year Enbridge provides a training conference and dinner for area’s that are home to parts of their pipeline. Lapeer County Central Dispatch applied for and was awarded the Enbridge grant. The funds received will be put towards continued 9-1-1 dispatcher training and the purchase of training materials for our Public Awareness & 9-1-1 For Kids program. 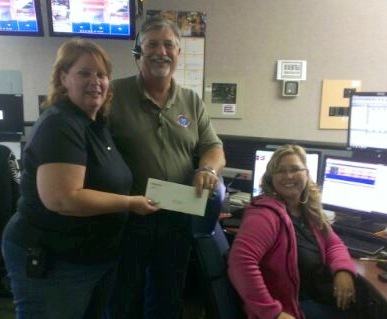 Director Martin and Dispatcher Anderson receive the check from Shelly Lliff, the Enbridge Public Awareness Coordinator.